Getting a stadium project off the ground is a difficult thing to do. Just ask D.C. United. Getting a stadium project off the ground in Massachusetts is darn near impossible. Just ask the Red Sox. After the news broke on Thursday that D.C. had reached a preliminary deal to build a soccer specific stadium, all eyes cast themselves on the Revolution, who are not only one of three MLS clubs without its own soccer specific stadium, but the last MLS original club that shares its home with a higher-profile tenant. And there’s no mystery why. Nearly every soccer specific stadium in MLS was built with taxpayer money, Red Bull Arena and the San Jose Earthquakes Stadium set to open next season being the only exceptions. Generally speaking, when MLS clubs ask for public assistance for stadium financing, they’ve gotten it. The Revolution? Still waiting. In the last 40 years, the commonwealth and/or its towns have said “no” to the Red Sox (twice), the Bruins, the Celtics, and the Patriots when they’ve asked for taxpayer support for stadium construction. No, no, no, and no. To that end, the Revolution have tethered their hopes to potential casino mitigation money in Revere. This is a sound play, until you consider that 1) there are no firm plans in place to build a casino, 2) no major stadium has ever been built with mitigation money, which will be allocated according to the wishes of the voters and 3) the mitigation survey posted on the Revere Journal last year did not list a stadium as an option. At this juncture, the Revolution have a better chance of having their stadium built by a company of leprechauns and unicorns than they do of breaking ground in Revere. The same goes for Somerville, where the city has discussed giving a parcel of land for the stadium itself, but the actual construction costs still fall upon ownership. Those costs are likely fall in the $200-$300 million range, which is a little less than the amount of money the Krafts just spent 12 years ago for Gillette Stadium. At the end of the day, it all boils down to smart investing. From a cold and practical stand point, the Revolution don’t need a new stadium. They don’t. Unlike Foxboro Stadium, the Boston Garden, or even Fenway Park, there is nothing structurally unsound or outdated about Gillette Stadium, where the Revolution aren’t paying a single dime on rent, unlike many of their fellow MLS clubs. Now, are there better places to watch soccer? No question. But let’s be honest with ourselves: what the Krafts would be paying for if it were to build a $250 million stadium isn’t better concourses, better amenities, or better seating. No, the only noticeable upgrade would be the atmosphere. Is atmosphere alone really worth $250-$300 million? There’s no evidence that suggests that the Krafts don’t want to build a stadium for the Revolution. Club president Brian Bilello has spoken on the topic at length many times. But given that the Red Sox, perhaps the most well-established and successful brand in all of Boston sports, couldn’t get the gears turning on a new stadium not once, but twice, the only hope for the Revolution is the same kind of sweetheart deal that eluded the Bruins, Celtics and Patriots. Short of the near impossible, the Revolution will be playing at Gillette Stadium for years to come. And maybe, it’s simply time to accept that. 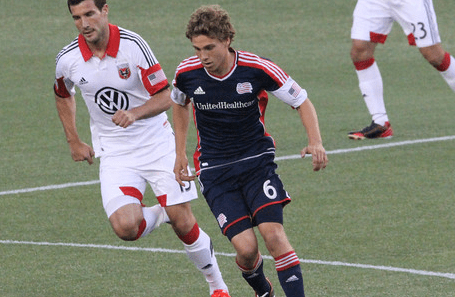 Three points against D.C. have proven to be an impossible task for the Revolution this year. In light of that, let’s look at the questions that face the local XI before they step into the dilapidated and dank RFK Stadium on Saturday. 1. What is it going to take to for the Revolution to finally capitalize off D.C.’s dreadful defense? Here’s a sobering stat: In their last 180 minutes of action against D.C., the Revolution have scored exactly one goal. That’s right. One goal against the worst-defense in east of the Mississippi. And that goal? For goodness sake, it needed the aid of Joe Willis’ back to fall through. Clearly, there are forces at work keeping the offense at bay. In the scoreless draw on Jun. 8, there were chances to be had, and the Revolution certainly had the players to score from them, with Juan Agudelo, Saer Sene, and Diego Fagundez all present and accounted for. However, a combination of predictable movement, poor finishing and a lights-out performance from Bill Hamid kept the hosts off the board. The video feed of their subsequent match – the U.S. Open Cup quarterfinals – harkened back to the days of dial-up and Dialog, so we can only rely written accounts. Based on those accounts, the Revolution’s success rested almost entirely on luck. The Revolution hit the post twice, and Juan Toja’s goal hit both the bar and Willis’ back before resting in the net. On their third try, the Revolution have to just keep it simple. They need to keep taking shots, adjust if the attack starts to dull, avoid the woodwork (that’s a big one) and finish, pure and simple. 2. What will the midfield look like? Jay Heaps raised eyebrows and elicited some R-rated ALL CAPS CRITICISM when last week’s lineup hit the Twittersphere. Some of it, of course, was warranted. It was an XI devoid of Lee Nguyen and Diego Fagundez, and their absences were filled in part by Clyde Simms and Chad Barrett. The objective: deal with the hand to hand combat the Crew promised to bring before unleashing the creative players. It may not have been a Marisa Miller kind of match, but it worked. This week, however, is a different animal. D.C. doesn’t foul nearly as much as Columbus, so we’ll likely see a different look in the middle this week. Plus, with the luxury of a full week’s rest, it stands to reason that we’ll see a more familiar cast. In light of that, expect a Fagundez-Rowe-Caldwell-Nguyen-Sene midfield. Of course, should Sene not be able to go, the creative and savvy Ryan Guy may get the nod over Barrett. 3. How does the Revolution stop an attack like D.C.’s? No, you read that right. D.C.’s attack may sound like an oxymoron right now, but let’s consider the reality. The lineup that Ben Olsen hands to the referee before kickoff will likely be similar to the one that lit up the Revolution for a trio of goals in Open Cup play. True, those three goals were scored against a squad that had plenty of reserves on the pitch. But three goals is three goals. It’s tough to tell what exactly D.C. was doing right on that late-June evening thanks to the slickly produced slideshow, er, video feed. What we do know is this: Chris Pontius lashed a shot past Matt Reis. Dwayne DeRosario outmuscled his mark and headed a Pontius corner kick through. Lionard Pajoy broke into the 18 before Jose Goncalves cut him down, setting up a strike from the spot. All that is to say this: D.C., as terrible as they look on paper, is capable of scoring in a series of different ways against the local XI. To keep them from channeling their Open Cup quarterfinal form, the back four and midfielders must work in unison. They have to limit space. They must be strong on set pieces. Above all, they have to be disciplined inside the 18, where players like DeRosario, Pontius, Pajoy and even el Pescadito himself can punish any team in a heartbeat. 4. Will Kevin Alston make his return to the field? RFK Stadium would certainly be an appropriate place to do it. Despite receiving medical clearance to return last week, he has yet return to MLS game action. Of course, it’s highly unlikely that he’ll get the start at left back. In fact, it appears that even if Chris Tierney couldn’t go, Darrius Barnes, Donnie Smith or even A.J. Soares (hey, we’ve seen it before) would get the nod ahead of Alston. But, depending on the late-game circumstances, don’t be surprised if Heaps gives his veteran wingback the signal in the closing minutes. Heaps isn’t all that far removed from his playing days, and he understands what certain things mean to certain players. He understands the situation in D.C., no doubt. He knows a late-game cameo, in front of Alston’s family and friends, would mean something bigger than the game itself. 5. Is the third time a charm against D.C.? It shouldn’t take a team like the Revolution three tries to knock down a basement dweller. It really shouldn’t. Heaps is doling out false praise when he says that D.C. is “a good team” like he did after the 0-0 draw. With all due respect to the Revolution head coach, good teams don’t average less than half a goal per game and, conversely, concede nearly four times as many. Unless, of course, it’s opposite day, and in that case, it wouldn’t be opposite day, which in turn would make it opposite day, but then again, well, let’s not go down that road. The numbers – and there are lots of them – tell us that United is the most beatable team in the east. Heaps is a firm believer in gameday preparation, and after watching the film on how D.C. deprived the Revolution of winning in their last two meetings, the mistakes have been addressed. The Revolution may not be a playoff caliber club at the moment, but they are a smart team. After learning their lessons from their June encounters, it wouldn’t be shocking to see them put together a solid performance and collect all three points on Saturday.